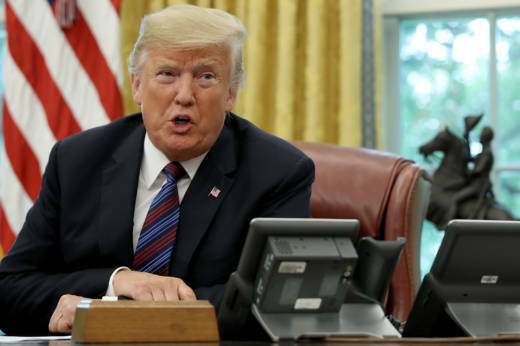 WASHINGTON — President Trump lashed out at U.S. tech companies Tuesday, accusing Google and others of suppressing conservative voices and "hiding information" and good news. He cited no evidence for the claim, which echoes both his own attacks on the press and a conservative talking point. Google, operator of the world's most popular search engine, responded by saying: "We never rank search results to manipulate political sentiment." Trump tweeted before dawn: "This is a very serious situation-will be addressed!" Hours later, Larry Kudlow, the president's top economic adviser, said the White House is "taking a look" at whether Google searches should be subject to some government regulation. Trump has made similar complaints before, but he carried it a step farther Tuesday. He added, without offering evidence, that "96% of results on "Trump News" are from National Left-Wing Media, very dangerous." A query Tuesday morning several hours after the president tweeted found stories from CNN, ABC News, Fox News and the MarketWatch business site, among others. A similar search later in the day for "Trump" had Fox News, the president's favored cable network, among the top results. Trump tweeted that Google and others "are controlling what we can & cannot see." In response, Google said its goal is to make sure users of its search engine get the most relevant answers to their queries quickly. "Search is not used to set a political agenda and we don't bias our results toward any political ideology," the Mountain View-based company said. "Every year, we issue hundreds of improvements to our algorithms to ensure they surface high-quality content in response to users' queries. A search for "why is the sky blue?" for example, yields initial results from NASA, universities and "Scientific American." Similarly, entering "Trump" and clicking the "news" tab will produce results from mainstream media outlets that large swaths of the population tend to trust -- even though Trump has derided some of these outlets as "fake news." Trump and some supporters have long accused Silicon Valley companies of being biased against them. But, while some company executives may lean liberal, they have long asserted that their products are without political bias, and indeed no such bias has been proved. Trump didn't say what he based his tweets on. But in a blog post over the weekend, conservative activist Paula Bolyard had said she found "blatant prioritization of left-leaning and anti-Trump media outlets" in search results. Bolyard based her judgments on which media outlets were left- or right-leaning on a list by Sharyl Attkisson, host of Sinclair Television's "Full Measure" and author of "The Smear: How Shady Political Operatives and Fake News Control What You See, What You Think, and How You Vote." Sinclair is a significant outlet for conservative views. Apple, YouTube and Spotify have permanently removed some of Jones' content, Facebook has suspended him for 30 days and removed some of his pages, and Twitter gave Jones a weeklong timeout and was mulling deeper changes to try to limit the spread of fake news, misinformation and hate speech. Trump has not named Jones, who is being sued for saying the 2012 shooting massacre at Sandy Hook Elementary School was staged, in any tweets on the issue. Jones has since said he believes the shooting did occur and has argued that the lawsuit should be dismissed because he was acting as a journalist. The issue is also of concern on Capitol Hill, where the House Energy and Commerce Committee, chaired by Rep. Greg Walden, R-Ore., recently announced that Twitter CEO Jack Dorsey will testify before the panel on Sept. 5 about the platform's algorithms and content monitoring.